I think that the weekend of August 17th just might be the most epic weekend in trail racing in Colorado, if not the country. Not only is it the weekend of the Pikes Peak Ascent and Marathon, but also the Leadville Trail 100 Run. This summer training for the PPA I’ve learned what these athletes already know: training at altitude is a whole different ball game than training at sea level, or even at a mile high in Denver. What’s the secret to running well at high altitude? Unfortunately, there is no secret or magic supplement. Running at high altitude is grueling, but just like the old adage “practice makes perfect” suggests, any runner can improve their altitude performance with a little practice. In the three months prior to when I set the Pikes Peak Ascent course record in 2012, I hiked or ran above 13,000 feet as much as possible. 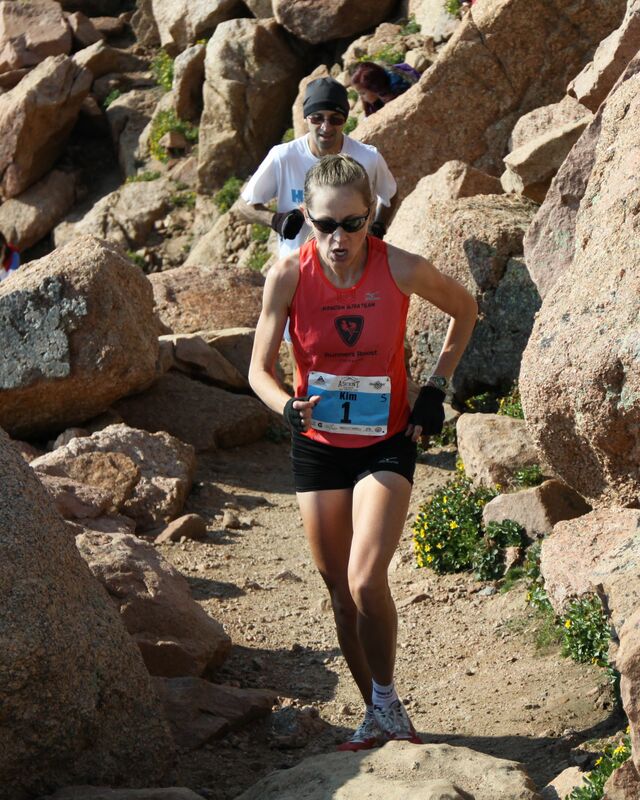 I knew that I would race my best if I spent as much time as possible above treeline. That time included tempo runs, intense intervals, long runs, and several hikes. With each bout at altitude, I could feel myself getting more and more acclimatized. Stride: Focus on taking short, quick steps and using a powerful arm swing. Think forward momentum! Breathing: Focus on rapid, deep breathing. If you are worried that everyone around you can hear how loud and fast you are breathing, then you are breathing correctly. Fueling beforehand: Running on an empty tank can increase the lightheadedness and nausea often experienced at high altitude. Make sure you are properly fueled and hydrated before your activity. Fueling during your activity: Exercising at high altitude suppresses appetite, so plan what and when you should eat prior to your activity. Make an effort to stick to your plan even if you don’t feel hungry. Chose foods or gels that require a minimal amount of chewing. Pacing: Start out slow and gradually increase your effort. Stay in tune with your heart rate, breathing, and movement. Focus on being relaxed and efficient as you power your way through the thin air. Practice: Run, hike, bike, camp, sleep…any activity at altitude will help you acclimatize. Believe that it will get easier, get creative about fun altitude activities, and enjoy being up high. This entry was posted in Exercise/Training, Sports Nutrition and tagged altitude training, mountain running, Pikes Peak Ascent. Bookmark the permalink. ← Lactate: Friend or Foe? I’m not sure if she utilizes Scott’s breathing techniques all the time, but I do know that he has shared some of his Pikes wisdom with her! Kim definitely listened and learned. A lot of my methods, approaches, and thoughts on prepping for the race were shared. I’m so proud of her focus and dedication. Note in the pic who is trailing Kim in the late stages of her record-setting Pikes race — Simon Gutierrez! Scooter! Hoping to see you this weekend. Little doubt in my mind that you know what you are doing. Your rapid breathing approach has always been one of the more interesting and candidly, befuddling ones to me. But hard to argue with your results! Scott Elliott has given both Corey and I such great advice and encouragement over the past few years. His best advice for Pikes: HIGH ELEVATION and STEEP must be the focus in summer training. He has shared his breathing technique with me, and although I do not consciously count my breaths/steps (I’m too uncoordinated for that! ), I think I intuitively follow his recommendation. Thanks SCOTT! See you guys this weekend!